Cubans, Ecuadorians and diplomats paid homage in Quito to three Cuban doctors who lost their lives in the huge quake that hit part of the South American nation last Saturday. 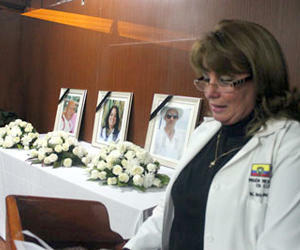 In a solemn ceremony, held at the Cuban embassy in the Ecuadorian capital, participants recalled that the deceased doctors Barbara Cruz (46), Leonardo Ortiz (53) and Eric Perez (41) left their families in Cuba to assist the Ecuadorian people. Ecuadorian lawmaker Maria Augusta Calle, who heads the Solidarity-with-Cuba organization in Ecuador, extended the deepest sympathies to the relatives of the doctors, to the people and the government of Cuba.